It comes just a couple of years after the new North End Zone Facility. Board is under construction already and will be active on Sept 8 for the home opener. A player tweeted a rendering this morning. They announced it was $1.3 Million (privately funded) and it will be the 3rd largest screen in all of D2. I'm sure the 13" black and white tv will look great. In all seriousness, good for MOSO! Welcome to the Jumbotron club! Looks awesome. Kudos to the University and donors for finding a way to make this happen. This is a big deal! They're beating Washburn. It's just a highlight from any season prior to Schurig's arrival in Topeka. Yes, nice catch of the missing "a". If we're getting picky, it seems a bit odd that mid-way thru the third qtr the Lions have decided to circle the wagon, with the Lion Pride percussion section on the field too. That's sure to draw a flag, although who cares with that big of a second half lead! 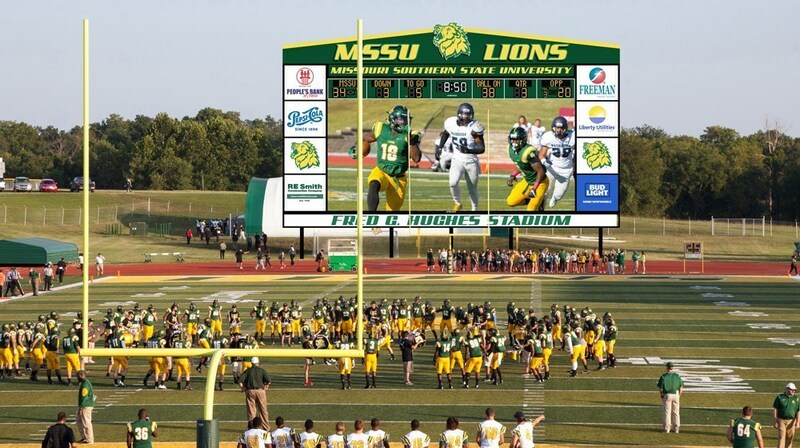 Where is MoSo gonna hang their "Bigger Video Board Than Pitt State" banner?